Snippets of Jack: "Hello, Beastie"
"Let no joyful voice be heard! Let no man look up at the sky with hope! And let this day be cursed by we who ready to wake…the Kraken!" -Davy Jones. Isn't this a really nice thought? Really brightens up my day. Davy Jones is very proud of his disgusting, vile, vicious pet, the kraken. Whenever he needs to destroy a ship but is too lazy to make his immortal crew to do it, he sends out his little pet. Like father like son. Sort of. Not really. You know what I mean. Jones instructs the crew of the Flying Dutchman to crank this wheel, which thumps the water and calls the dear kraken. As he does this he sings a little melody to it, pronouncing it "krack-in". Pintel and Ragetti have some what of an obsession over this beautiful beast. Pintel: "I don't think it's 'Kracken,' anyways. Always heard it said 'Kray-kin'." Ragetti: "What? With a long "A"? Na-na-na-na, "Kroh-ken"'s how it's pronounced in the original Scandinavian, and Kracken's closer to that." Pintel: "Well we ain't original Scandinavians, are we? Kray-kin." Ragetti:"It's a mythological creature, I can calls it what I wants!" It's DAVY JONES' mystical creature so therefore it's pronounced how Jones' pronounces it. Do you really want to disagree with someone who owns a gigantic sea monster? Jack tries tricking Jones and we all know how well that works out. Bootstrap Bill stops on board the Black Pearl to warn Jack that if he doesn't join Jones' crew soon, the kraken will come after him. Bootstrap gives Jack the black spot, which is how the kraken knows who to hunt. In a hurry to get out of the open water and away from Jones' territory, Jack quickly sails the crew inland, but looses his dear hat in all the crazyness. Gibbs offers to turn around to retrieve it, but Jack is too desperate to return. So strange sailors who don't speak English pick up Jack's hat in the middle of the ocean. They get a good laugh out of it, before they die; their whole ship is swallowed up by the kraken. When Will Turner secretly escapes the Flying Dutchman with the key to the chest of Davy Jones, the captain is of course not happy. But he can already see the ship in which Will is on. It probably wouldn't be too hard to sail on over, board the ship, take will back, and then kill him. But where would be the fun in that? Plus, then Will would for sure die. These innocent sailors, of course, freak out when they see the Dutchman. Will: "I've doomed us all." Not gonna lie, you kinda did. Then, the ship suddenly is attacked by the evil sea monster. Captain: "Oh, Mother Carey's chickens! What happened?" Wow. Mother Carely's chickens? First odds bodkins and now Mother Carely's chickens? Please, I know you are about to die, but PLEASE control your language. This is a Disney movie! Everyone but Will seems to think they ran into a reef and that is why they are halted. Will is smart and climbs high up on the mast by himself, not warning the others. But they understand once the captain is suddenly pulled into the sea by a giant tentacle. Now, these are the strange sailors who Elizabeth escapes Port Royal on. She is no longer on the ship, but she left her dress, which Will discovers. Of course, Will has other things to think about like living at the moment, but the idiot crew members apparently don't. One holds up the dress screaming, "Here it is! Take it!" Believing that "This Ship Is Haunted" by the dress and its all the kraken really wants. There is some creepy organ music played in the background for dramatic effect. Was Davy Jones' playing it I wonder. The kraken tears apart the boat and the Dutchman take the survivors. But according to Jones, there is no survivors. So they slaughter them all. Will, however, barely survives. He swims over, back onto the Dutchman, (nice work) and hides in the front. Out of the frying pan, into the fire . . . and then back into the frying pan. But not to worry, Will again returns to the fire when the Black Pearl is attacked by the kraken. Jones: "Who sent that thieving charlatan onto my ship? Who told him of the key? 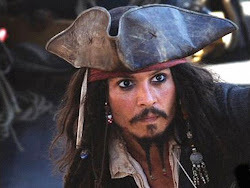 Jack Sparrow!" Who else? So we face yet another kraken attack. Which is rather successful, thanks to Elizabeth. The ship goes down with it's dearly beloved captain. The kraken roars in Jack's face, and spits up some pretty gross stuff all over him, including Jack's lost hat! Jack: "Not so had. Oh!" He puts his hat on and braces himself for the next adventure: "Hello, beastie." And there they go. Davy Jones watches contently: "Jack Sparrow, our debt is settled." Or so it would seem.